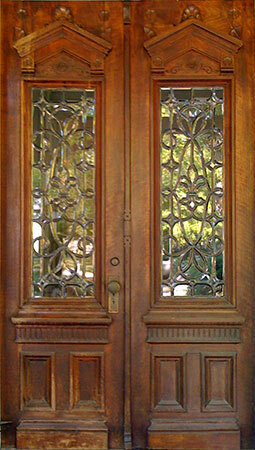 The two beveled glass windows in the front doors were original to the home. 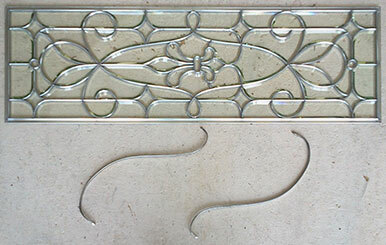 Many other beveled windows are present through out the home having the same fleur de lis design theme. One day I received a call from the home owner stating that a small piece of beveled glass had fallen out of the front door. 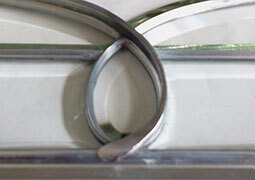 I showed up at the home the next day and the beveled window in question had started coming apart. It was installed in the door which was used the most. Over the years the weight of the window, moving back and forth as the door would open and close, weakened and had broken many of the solder joints. I removed both of the windows to the studio and started the restoration process. They were constructed of colonial zinc which was 3/16" wide. 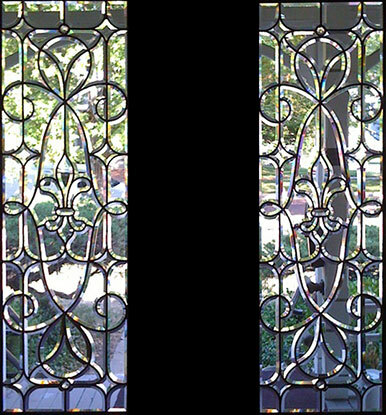 I removed the olde zinc, cleaned the glass, and assessed the shape of the olde bevels. A total of ten new beveled pieces were needed before the re-assembly could take place. Nearly half of the broken pieces were the four pointed stars located around the perimeter. The windows were re-assembled using the same colonial profile.